As head coach of a college football team, Kirby Smart has a wide spectrum of duties; apparently, so does his house. 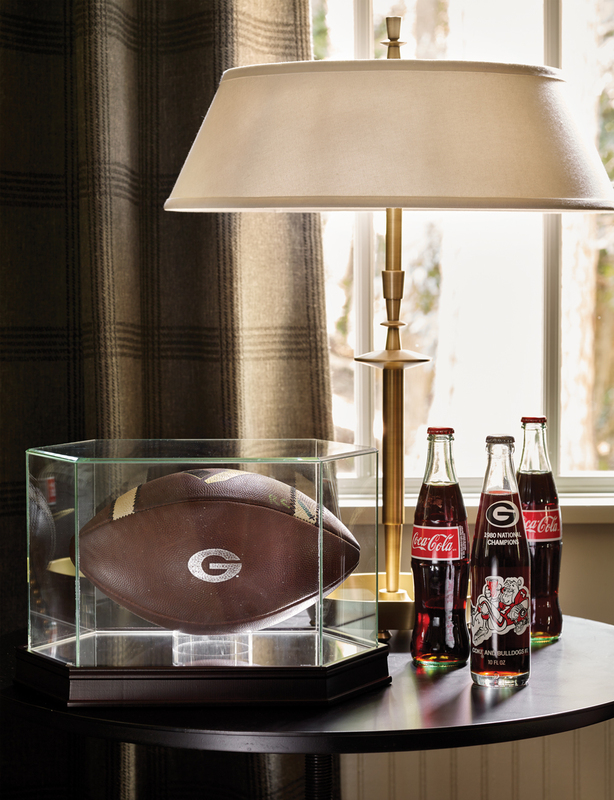 The Smarts’ newly remodeled Athens home not only accommodates day-to-day family life, but it also serves as a place to entertain potential players and other VIPs integral to the University of Georgia football machine. “It makes recruits feel like they’re part of the Bulldog family when you let them come into your house,” says Kirby, UGA head coach since December 2015. These officially sanctioned visits with prospects and their parents might include playing games with the three Smart children, enjoying an informal meal, or admiring sports memorabilia. The Smarts were drawn to this property for the nearly three-acre lot, the original stone house, and its proximity to town. 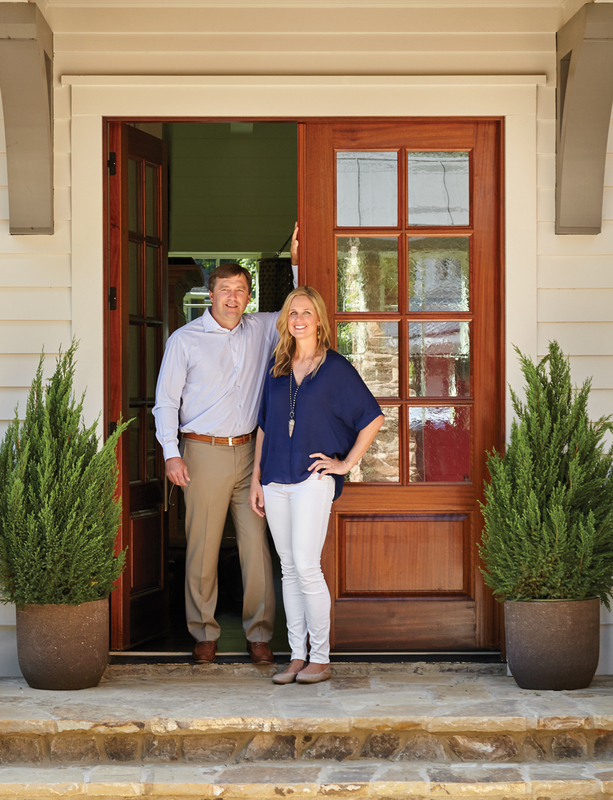 Husband-and-wife team Paige Ruhl (residential designer) and Jim Ruhl (builder) of DreamBuilt created the new addition. A dining area in the recruiting side has a stone wall as a focal point but also features steel windows, cypress ceiling beams, and a travertine floor. Generous-sized dining chairs can accommodate football players. A game table on the recruiting side encourages casual interaction. “It needs to feel like home,” says Kirby, who has seen other coaches successfully incorporate official duties into their personal residences. 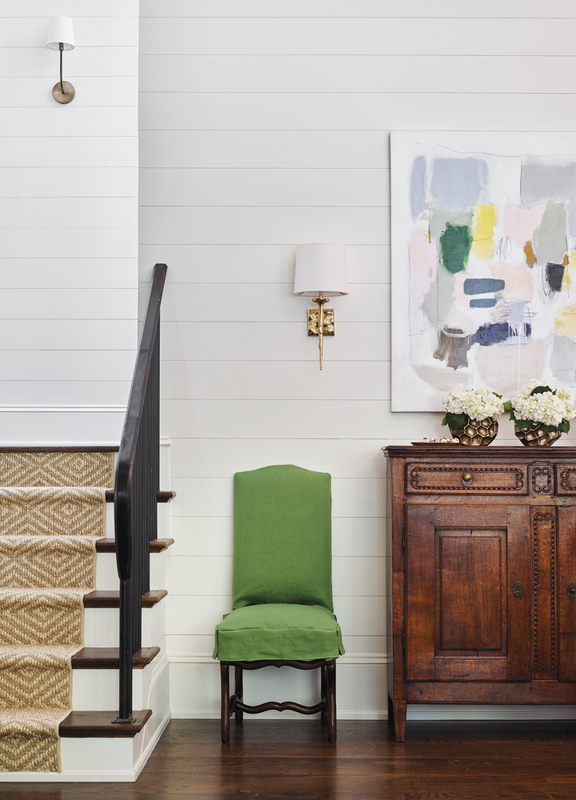 When Mary Beth first spotted the 1920s cottage, she knew it had the charm they were looking for: heart-pine floors and tall ceilings, with stone covering exterior and interior walls. The structure was built as a hunting lodge but later expanded and turned into a private residence. 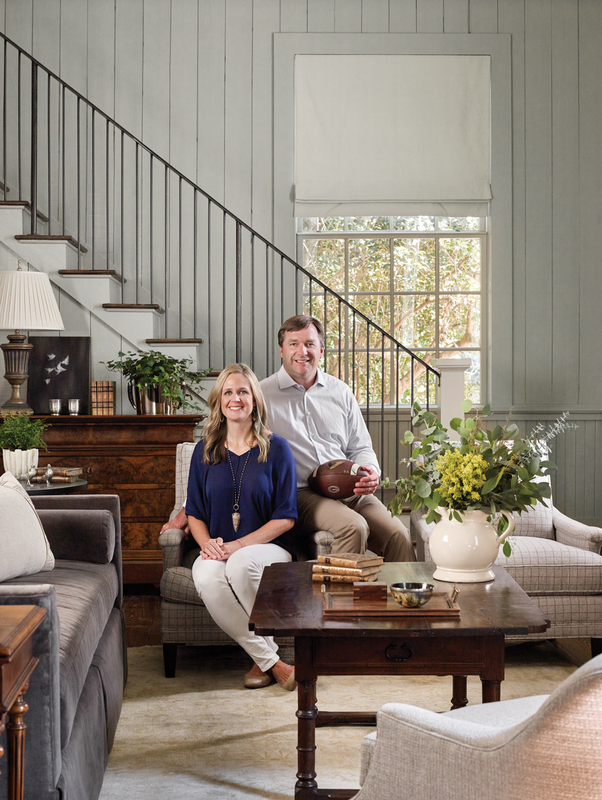 With help from interior designer Cindy Dunaway Waites and DreamBuilt Homes, the Smarts replaced a previous addition with new personal quarters and remodeled the historic cottage for football functions. The two buildings are linked by a dining room that can serve either side. The family moved in this past summer, just before the start of preseason practice. 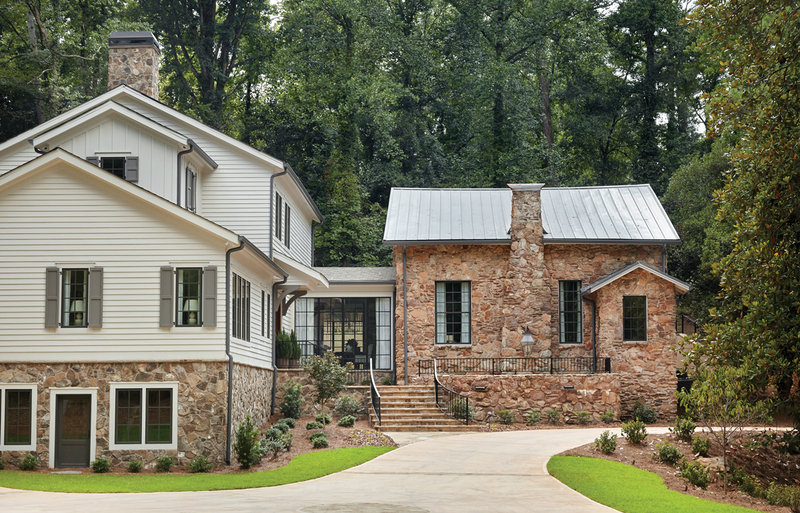 The stone facade influenced design decisions for the new construction, steering everyone in the direction of modern farmhouse style—with shiplap walls, barn doors, industrial lighting, and touches of pecky cypress. Waites placed antiques and original art in both sections of the property, but the two spaces have some differences, too. “The recruiting side has more of a masculine feel, with darker colors and a game table, whereas the main house is a little lighter and ‘cleaner,’” she says. Kirby weighed in on some design decisions—such as, not surprisingly, television placement for sports watching—but his days have been nonstop ever since taking the reins of the SEC team. Two tables in the breakfast room accommodate many guests and make room for homework or puzzles as well as meals. 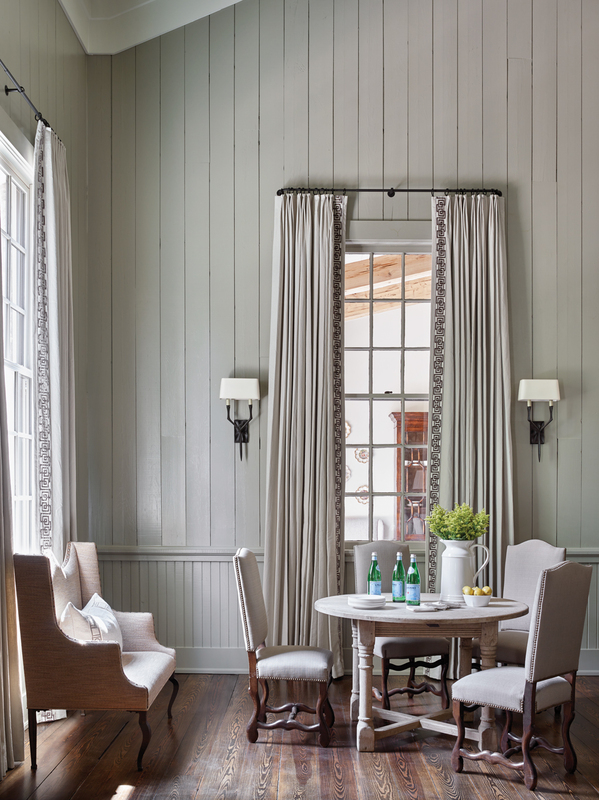 Cafe curtains in a lively Schumacher fabric tie together all the colors of the house, and oversized drum pendants visually link the two tables. 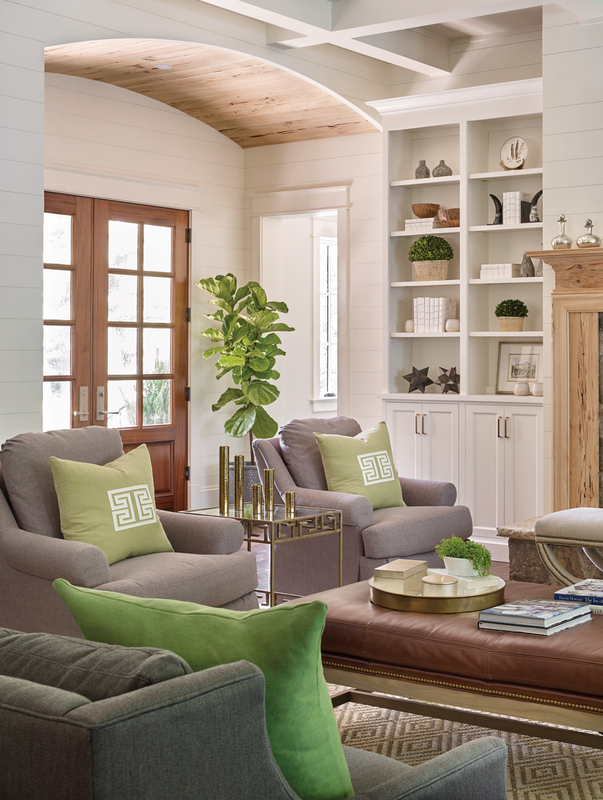 The entryway ceiling is barrel-vaulted and covered with pecky cypress that adds to the house’s organic feeling and complements the gray-and-green color scheme. One thing you don’t see much of in the house? Red and black, those bold colors that fill Sanford Stadium every fall. “It wasn’t necessarily intentional not to use red, but we just happened to choose other colors that suit a young family,” Waites says. “I also worked on Kirby’s UGA office, and we certainly used plenty of red there.” Grays and greens against a background of cream flow throughout the Smart house, with art and accessories adding pattern and accent colors. 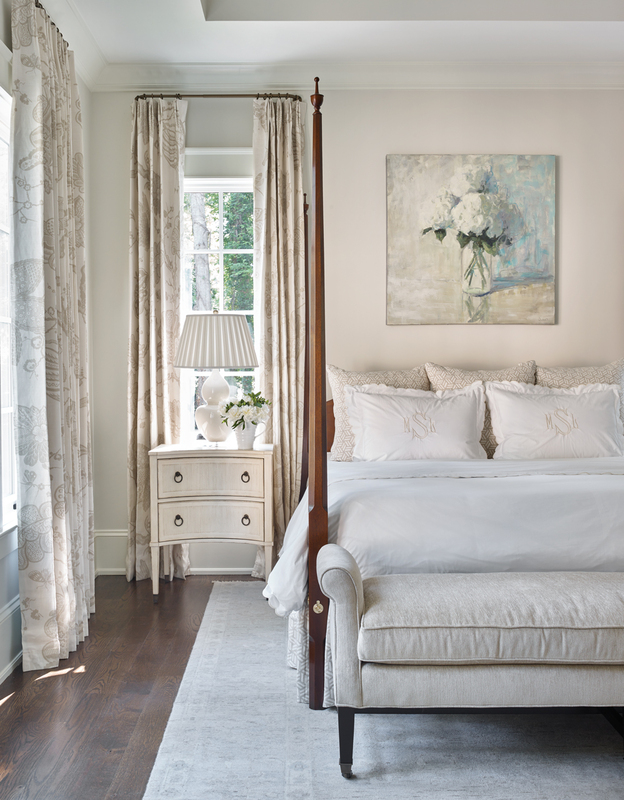 “We’d always wanted to have a nice master bedroom and never got around to it, so this one makes me happy,” says Mary Beth. “It’s just so soothing.” The floral painting above the bed is by Athens artist Kathy Cousart, a former UGA women’s golf coach. 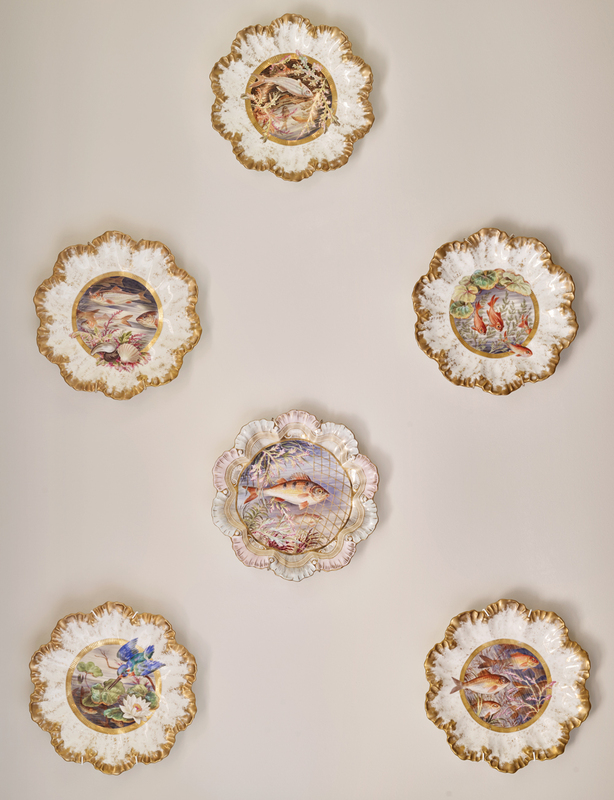 Hand-painted china on the dining room walls was created by Mary Beth’s great-grandfather, a renowned porcelain artist. “Lycett china is well-known as a collectible item—there are pieces in the White House—although this was also a sentimental choice for Mary Beth,” says Waites. The five members of the Smart family—which includes twins Julia and Weston, and son Andrew—have embraced life in Athens, especially now that they’ve moved into their permanent home. They cherish privacy but enjoy heading out to watch other UGA sports (tennis, baseball, and, of course, women’s basketball) or dining at family favorites LRG Provisions, Donna Changs, and Five & Ten. Kirby may be a local celebrity, but he also wants a regular family-guy life around town. “The more we go out, the more normal it becomes,” he says. Having a home of their own now as a sanctuary—even one they share with others—is a major score for the Smarts. Mary Beth’s home office is right off the kitchen and can easily be closed off by a sliding barn door. 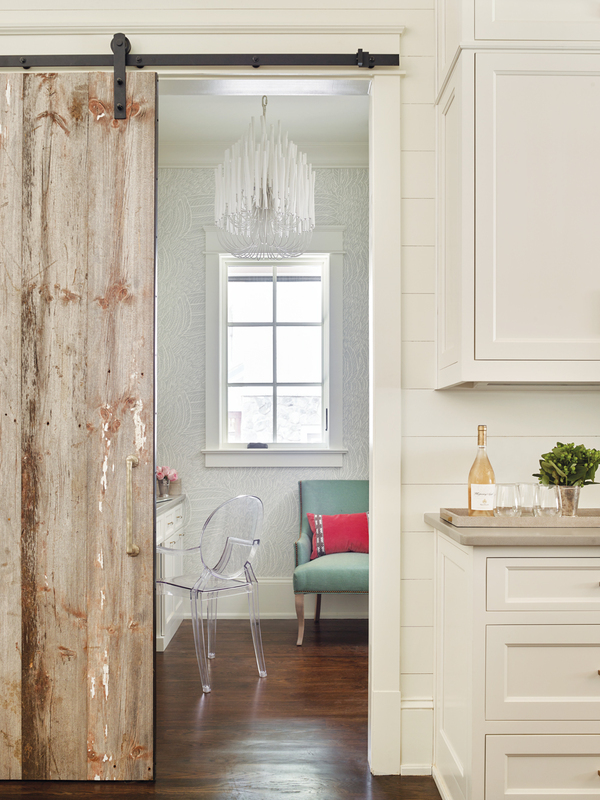 The glamorous light fixture is by Arteriors. Among her many roles, she runs the Kirby Smart Family Foundation, which gives back to families facing adversity, with an emphasis on childhood cancer. 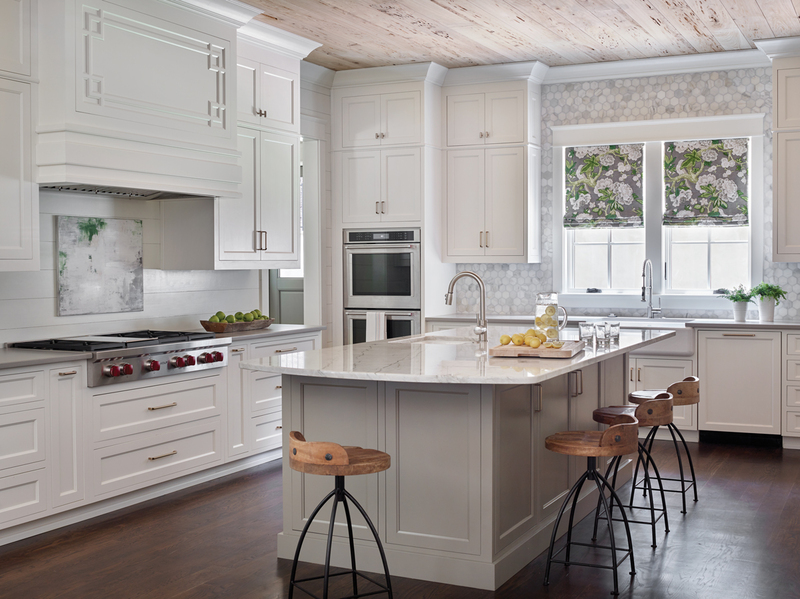 The spacious kitchen features durable quartz countertops and custom cabinetry from local maker Oconee Cabinets. “What’s not to like about this kitchen? 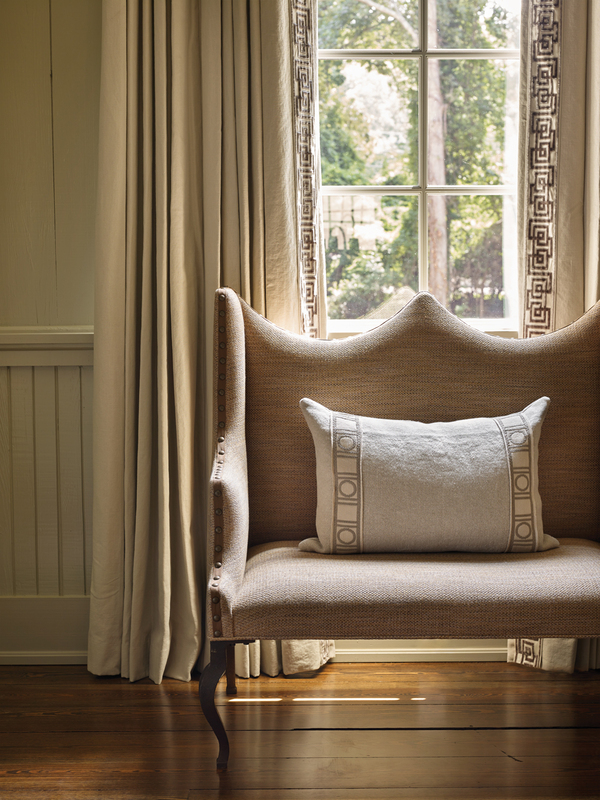 It’s bright and airy with a space for everything,” says Mary Beth. Upscale appliances are a treat, too, she says. The first time she made breakfast on the Wolf range, Kirby declared the eggs the best she’d ever cooked.